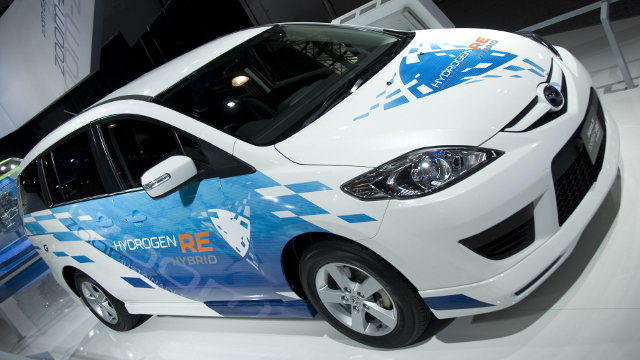 Mazda unveiled their Mazda5 Hydrogen RE Hybrid Sky concept in 2010. Photo by Dave Pinter on Flickr. Although hydrogen fuel-cell vehicles (FCVs) were the alternative-energy favorite of the George W. Bush administration, current U.S. Secretary of the Department of Energy Steven Chu has been no cheerleader. After dismissing a hydrogen fuel cell strategy in 2009 as “impractical,” Chu redirected federal energy research funds toward plug-in electric vehicles. The DOE secretary believed EVs were a more realistic alternative to fossil fuels. Mercedes-Benz is among the automakers experimenting with hydrogen fuel-cells. Three years later, new realities in the energy industry are pushing Chu into giving the world’s simplest element a second look. “Several things changed my mind,” Chu told host John McElroy during an interview on the web video series Autoline Daily. Chief among them, however, was that “We have natural gas in abundance.” Hydrogen can be extracted from natural gas. While Chu maintains that our country’s primary research focus will continue to be EVs, the controversy surrounding natural gas would make the revival of fuel cells in our energy policy a significant change of heart. And he’s not alone: In July, several U.S. senators, on both sides of the aisle, re-launched the hydrogen-promoting Fuel Cell and Hydrogen Caucus. So what do FCVs have to offer that electric vehicles don’t? Convenience is one immediate advantage. The range of a fuel cell-powered vehicle averages around 300 miles. The Tesla Model S, currently the passenger electric vehicle with the longest battery life, tops out at 265 miles between stops. The refueling process for FCVs takes five minutes – not far off the mark from a conventional vehicle. But unlike gas or diesel engines, a car running on pure hydrogen fuel emits eco-friendly water and heat as exhaust. But since there are no natural reservoirs of hydrogen on Earth, the gas must be extracted from water or petroleum products such as natural gas. This raises an interesting environmental dilemma, because our country’s abundant natural gas is the result of hydraulic fracturing, or “fracking,” in underground shale beds. The effects of fracking on municipal water supplies have sparked wide spread concern from some communities where fracking is taking place as well as environmentalists. Oil-Shale Development: Mahogany Flats Research Station, Rangeley, Colorado. Photo by SkyTruth and Randy Udall on Flickr. On the other hand, Chu said he is intrigued by the water gas shift reaction process, which converts natural gas into pure hydrogen and carbon dioxide. The resultant hydrogen can be used for automobiles, and the carbon dioxide stream can be used to power more hydraulic fracturing, with a low net carbon footprint. Do the environmental advantages of hydrogen fuel cells and natural gas outweigh fracking’s potential dangers? Like many environmental decisions, there’s no easy answer – at least perhaps until we’re able to figure out how to build the infrastructure for hydrogen filling stations. Why does this raise “an interesting environmental dilemma”? If “a car running on pure hydrogen fuel emits eco-friendly water and heat as exhaust. and gas can be extracted from water, then why the frack, frack for gas? Just pump the water, or better yet get it from the surface. “But since there are no natural reservoirs of hydrogen on Earth, the gas must be extracted from water or petroleum products such as natural gas.” Just not so. Because extracting Hydrogen directly from water requires more energy than it gives you back, of course. It’s like using energy from a rechargable battery to charge another battery, and then reversing the process. every time you do that, you lose some energy along the path. Another way you can look at this is trying to replicate the natural process that turns dead trees and plants into Oil. It took PLENTY of energy and thousand of years to create all the Oil we use today, but the actual energy we get by burning 1 gallon of Gasoline is way less than the energy it took to create that gallon back in the day. The only difference is that we did not provide that energy, we just found plenty of oil ready to be used. Thanks for the comment, David. It’s a good question: Why not just extract hydrogen from water? Unfortunately, as Marco points out, it’s not a very efficient process. You use more energy extracting the hydrogen than the amount of energy you would gain. 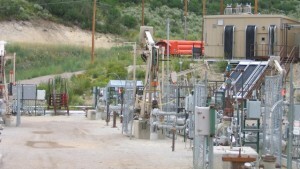 You don’t lose as much energy extracting hydrogen from natural gas. One of the things I see very often in the discussion of the HFC and its applications is that people forget about synergistic relationships between processes. One of the most impressive combinations of renewable resources is coupling solar and hydrogen power together. Honda has a Home Energy station that is hydrogen-based, using that strategy. You collect solar power to spark the electrolysis reaction and that begins the generation process. The station can generate fuel for an automobile or electricity and heat for use in the home. HFC’s are the next step in energy generation for Earth. They may not be the final or the absolute best method for harvesting energy, but they improve on our current fossil fuel production systems with increased efficiency and drastically less environmental impact. Also, notice that the comments of Mr. Chu all aim toward big oil, which is, of course, big money. That gigantic leg of the US economy is important, but the US, and the rest of the world needs to begin at the very least, a gradual shift towards less negatively-impacting energy sources to fulfill our energy needs. Perhaps another synergistic relationship where fossil fuels can provide the input energy to start the H2 generation process (by electrolysis) or the raw material (natural gas) to harvest it from are a long term solution. That extends the life of the fossil fuel supply drastically and allows for conversion of the fossil fuel businesses over time to the greener alternatives. Eventually, the shift has to happen because we will run out of fossil fuels. Hydrogen never gets used up by HFC’s, it just changes states. C.K. Hickey is the content intern for QUEST. He graduated from UC Santa Barbara with a degree in Film and Media Studies in 2008, and is currently a student at the UC Berkeley Graduate School of Journalism. C.K. thinks of himself as a multimedia adventurer. He's always looking for new and interesting ways to deliver the news, such as newsgames and infographics. Before coming to QUEST he reported for Salon, Patch, Mission Local, East Bay Express and Current TV. In his spare time he enjoys his piano, a good book, a good meal, struggling to keep up with his Twitter feed, transportation, the environment, birdwatching, movies/TV/video games, and hiking. But not all at once.